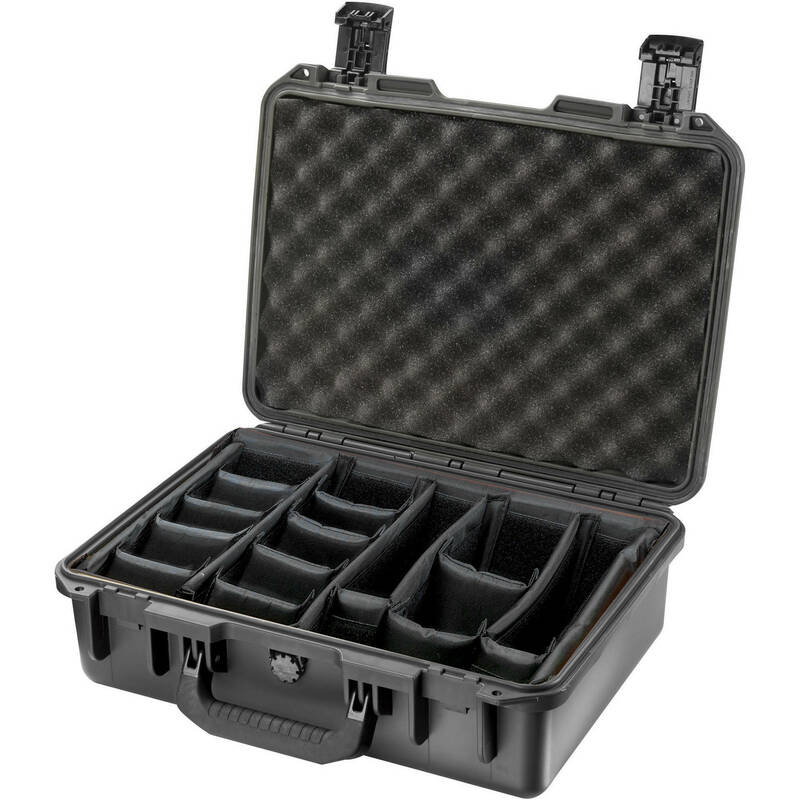 The Pelican iM2300 Storm Case with Padded Dividers (Black) is an injection-molded case made of HPX high performance resin, that is virtually unbreakable, dent-resistant and shatter-resistant. It is tough, rugged, lightweight, airtight and watertight. There is a permanently attached Vortex valve that automatically adjusts air pressure without letting in water, and won't unscrew from the case. Press & Pull latches open with the push of a button, yet stay closed securely under impact or stress. The case has unbreakable molded-in hasps that allow the addition of standard size padlocks. It has hinges with integrated feet that hold fast under impact, and create a flat surface for upright stability. It is carried by a double-layered, soft-grip, solid-core handle that provides strong, durable comfort. Box Dimensions (LxWxH) 18.9 x 14.3 x 7.4"
iM2300 Storm Case with Padded Dividers (Black) is rated 4.8 out of 5 by 10. Rated 5 out of 5 by Anonymous from The best protection The Hardigg Storm Case is the best possible way for me to store and transport expensive photographic equipment. The case seals in the equipment and protect it against, moisture dust and bumps. It opens and closes securely and is easy to manage. I took the padded deviders and feel that it doesn't cater that well for a DSLR with a big lense on it. Some of the adjustable devisions are far to thin and flexible to properly devide and protect. The thicker deviders are very strong but not flexible enough to take the shape and form of a big DSLR with a big lense on it. It's the best though for protecting my valuable assets. Rated 4 out of 5 by Prelov from Amazing case+ good service from BH & UPS I fit in all my electronic devices(laptop,dslr,lenses, and many other little things. All in is very save, is a bit heavy and big, but u must deal with it. this case i can fit in my Deuter backpack of 75+10 l and no need be worried i gonna crack some device! Service and price from BH is excellent, UPS took 5 days to deliver in New Zealand=Awesome!Excellent tracking, so you can see where the package is! Rated 5 out of 5 by gsw_central Connecticut from LIKE HAVING YOUR GEAR IN A VAULT I use this awesome case to transport my two high end Canon cameras and associated gear everywhere. Safe on the plane no matter who knocks it around. Tight fitting top keeps everything out. Case is almost bomb proof. I plan to add another case soon for my other audio and video equipment. Rated 5 out of 5 by Jeff from Amazing case I use this to carry my two micro four thirds cameras (epl5 and g5) along with 4 lenses and all my other accessories with still room to spare. The case itself is top quality and keeps my expensive equipment safe and secure. I couldn't have asked for a better case. Rated 5 out of 5 by POD from Perfect for a fleet of point and soots We are using these cases to house our fleets of digital point and shoots which we use in our high school classes. They are easy to keep organized and labeled, light and comfortable to tote, and seem solid, durable, and like a worthwhile investment. Rated 4 out of 5 by nommek from Good Box Great, rugged box. Dividers are so much better than stupid pick foam. You can get much more gear in, it's better protected, and you can rearrange as you like. What length of lens can you fit standing-up in this case? The interior dimensions show 6 height, but it must be less with the eggshell foam isnt it?